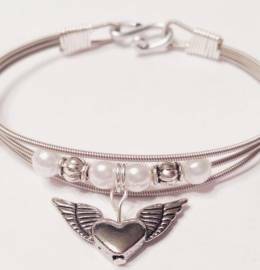 This item is sold by Wings of Hope Living Forward Inc. This awesome bracelet is made from Guitar strings. you won't find them anywhere else. Makes a great sympathy gift remembering a loved one or just an overall awesome gift for someone you love. We bring Grieving Parents together for healing with 5 to 7 day retreats, and provide resources for groups, books, non-profits, crafts, information and more. Buying this item, you are supporting Wings of Hope Living Forward Inc. This item will be sent from Gilbertsville, PA 19525, USA.